PALISADES PARK, N.J. – An array of brand new incentives has been rolled out at Trio in Palisades Park just in time for the Holiday season. Topping the list is a special offer that significantly increases homebuyer savings at the already-affordable Bergen County high-rise condominium building. For a limited time, purchasers can receive $20,000 off the price of a one-bedroom home, $30,000 off the price of a two-bedroom home and $50,000 off the price of one of Trio’s spectacular Penthouse residences. What’s more, every home purchase is being offered with a free parking spot. The exceptional promotions do not end there. Also being offered at Trio are special broker bonuses that include a $5,000 Amex card with the sale of a Penthouse home and a $2,500 Amex card with the sale of any other residence. “Real estate professionals have played a large role in the sales success at Trio and we wanted to offer a special program to reward them,” Ms. Hwang points out. In a market dominated by new high-rise rental buildings and older condominium and cooperative buildings, Trio has emerged as a popular choice for buyers looking to own a home with the latest interior appointments and finishes in an amenity-rich, maintenance-free building. Homes at Trio are priced from just $330,000 and are available for immediate occupancy. 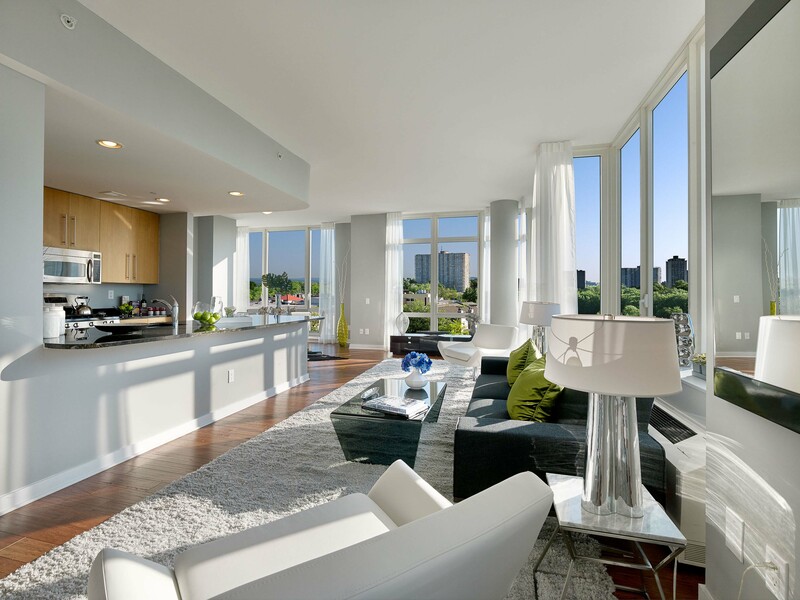 The residences boast floor-to-ceiling windows, hardwood floors and modern recessed lighting. Gourmet kitchens include granite countertops, stainless steel GE appliances, custom maple cabinets and Kohler fixtures. Designer bathrooms feature Crema Marfil marble floors, granite countertops, custom maple vanities and Kohler fixtures. All homes also come with individual washers and dryers. PALISADES PARK, N.J. – – More and more children today are rewarding parents who have dedicated their lives to nurturing and caring by purchasing second homes where mothers and fathers can enjoy a comforting and relaxing environment. Such was the case for Kathy Chung, who found a special way to recognize her parents many years of dedication and love with an exciting new lifestyle. 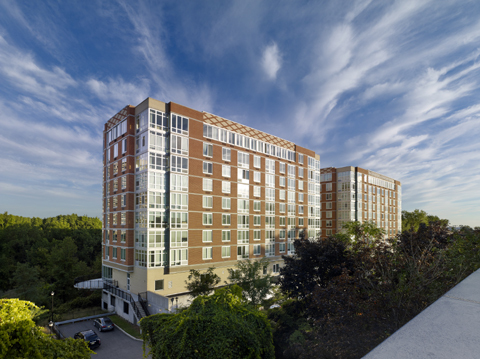 Trio in Palisades Park, N.J. turned out to be the ideal new community for Mrs. Chung’s parents as it offered a care-free living environment, elevator building, comfortable and bright condominium homes and on-site recreational and social amenities that create a close-knit environment. Trio’s location in Palisades Park was another considerable advantage for Mrs. Chung who can easily visit her parents from her home in Ridgefield, N.J.
Trio features luxurious one-, two- and three-bedroom condominiums priced from just $310,000. Condominiums at Trio range in size from 742 square feet to 1,751 square feet and boast designer elements including floor-to-ceiling windows, hardwood floors and modern recessed lighting. Gourmet kitchens include granite countertops, stainless steel GE appliances, custom maple cabinets, and Kohler fixtures. Designer bathrooms feature Crema Marfil marble floors, granite countertops, custom maple vanities, and Kohler fixtures. All homes come with an individual washer and dryer. Immediate occupancy is available. Trio also features an exciting suite of newly-renovated, five-star recreational amenities including concierge service, the lounge with billiards, ping pong and large screen TV with catering kitchen; state-of-the-art fitness center, the yoga studio, game room, virtual golf simulator, outdoor terrace and a business center all located within the buildings. Covered parking is also available.